Your furry friends always welcome a cat toy! Certainly, catnip toys, mouse toys, and ball toys will keep kitty entertained for hours on end. Cats are playful by nature. They enjoy hunting and chasing small critters around. And since many domestic cats spend most of their time indoors, a toy provides cats with a wonderful way to spend all that pent-up energy and have fun at the same time. Cats, just like people, need to be active in order to stay healthy. Toys encourage your cat to exercise in a fun and healthy way. And as I said before, cat toys are especially important for indoor cats because, sometimes, they are less active than their outdoor counterparts. Even though cats don't need as much exercise as other animals do, playtime is good for their general well-being. 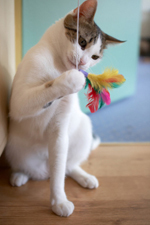 When choosing the perfect cat toy, safety is an important factor to consider. Below, you will find several suggestions to select a safe toy for your cat. When selecting a toy, also consider the personality and age of your cat. Some kitties like playing a lot while others enjoy curling up in a nice spot. Also remember that kittens are more likely to be more active than older cats so make sure to cater to their needs. If you want the toy to last, make sure that it is made of a sturdy, durable material. Cats love playing with ribbon, but it can be dangerous for them. Remove ribbon or yarn from a toy before giving it to your cat. Be careful with strings. Cats can easily entangle themselves and this can cause serious accidents such as strangulation. Strings may also cause problems if swallowed. I know that most cats love playing with string toys, so if you buy your cat a string toy be sure to supervise your cat while he plays with his toy. Cats also love playing with feathers. If you buy a toy with feathers, make sure you monitor you cat just in case he swallows the feathers. Avoid toys with too many feathers. The toy must not contain detachable parts that are too small. Your cat might choke if he or she swallows them. The toy itself must not be too small for the reasons explained above. Make sure that your home is safe for your kitty. Cats love playing with dangling cords. Ensure that the cords of your blinds are secured. Electric cords are another hazard so ensure that all cords are unplugged or properly covered. 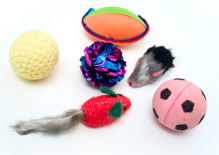 Ball toys, rattles and toys that move are perfect for cats that enjoy playing. My cat loves a battery-operated, soft mouse toy that makes noises. He likes chasing that toy around! Go to our interactive feline toys page for more information. Another great option is a remote control toy. This is the ultimate interactive toy for cats of all ages. Cats also like scratching, so a good scratching toy will delight them. For added fun, you can sprinkle catnip on the scratching post and attach a couple of dangling toys. They might enjoy soft balls and plush toys. There are toys made of machine washable material, which is very convenient if you want to wash the toy on a regular basis. Also ensure that the filling is safe and properly secured. Catnip toys are another good choice since they can encourage your cat to play. And, there are several options to choose from. See below for more ideas. Does your cat prefer to play alone? Mouse toys and battery-operated toys that make noise will delight your cat. They might also enjoy toys you hang from doorknobs. If you want to spend quality time with your kitty, play with him or her! Despite what many people think, cats are very affectionate and enjoy spending time with their owners. A great idea is to roll a ball for your kitty to chase after. Catnip and mouse toys will surely please any cat. Catnip in particular will delight any kitty!!! In addition to traditional toys stuffed with catnip, you can also find catnip bubbles. Visit our catnip toys page for additional info. Want to make your own toys? Read this article about homemade catnip toy . Even though you can find many fine cat toys on the market, you can have plenty of fun by creating your own toys. You can use very simple and inexpensive materials such as paper, cardboard and pieces of sturdy fabric. You can make a ball out of a sock. If you want, you can fill the tip of the sock with catnip. If you know how to sew you can make a little sack out of a strong and durable material such as denim, and you can also fill it with catnip. You can make a ball out of paper. Just take a piece of paper and squash it into a ball. The wonderful thing about this toy is that is easy to make and easy to dispose of! You can use the cardboard rolls from the toilet paper and cut them into smaller cylinders. Ping-pong balls make a great toy for cats. They are made of a strong material and are just the perfect size. You can get a good size cardboard box for your kitty to nap in. For some reason, most cats enjoy cardboard boxes. A small stuffed toy is another good toy for cats, especially if they can carry it around. Just make sure that the filling is safe and properly secured. Preferably, the toy should not contain small parts. The toy should also be child safe. Here are more homemade toy ideas. I hope these suggestions help you find the best cat toy for your cat or kitten. Your cat will enjoy these fun toy boxes that stimulate your cat's mind and hunting instincts. They can find a fun toy or a delicious treat. Now it's time to put away all of those toys! A great idea is to have a container to store away your cat's toys once he's done playing. You can make a storage unit yourself. The simplest way is to transform a sturdy cardboard box into a cat toy box. If you want to buy one, you will find several options to choose from. Visit our pet toy box page for more ideas.